I appreciate carving and decorating with real pumpkins for fall and Halloween. Doing it is another story. 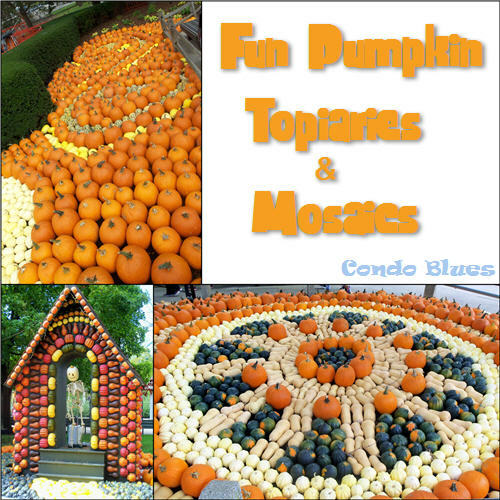 Pin this post for pumpkin decorating ideas! Carving pumpkins is messy, goopy, and if you do it too early, moldy by the time Halloween rolls around. Besides, if don't carve the pumpkins, we can make fresh pumpkin puree (learn how on my food blog Lazy Budget Chef) and use it to make fantastic food after Halloween. Lacey likes this idea very much. This is how you decorate with live pumpkins? Lisa I expect more from you. Step up your game girl! Lacey is right. Four pumpkins plunked in a pile in the living room isn’t a festive or even artful autumn decor. How about plunking down a gazillion more to make an outdoor mosaic? 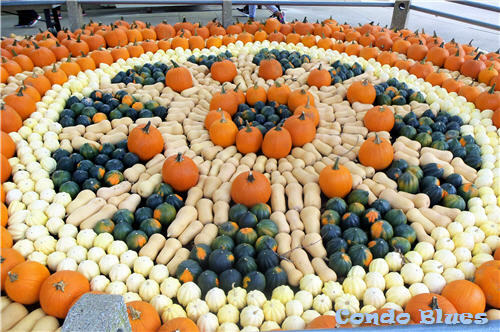 When I visited Cedar Point after the BloggyConference the grounds crew came up with a clever way to spiff up the winterized fountains and annual flower beds with elaborate pumpkin and squash mosaics. 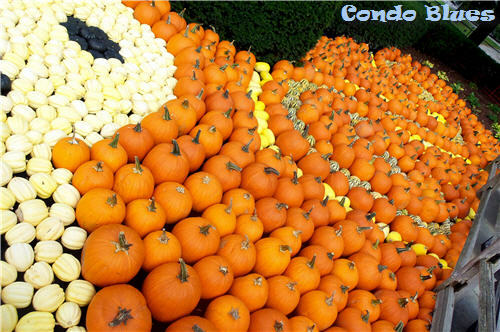 What an unique idea to try at home – after you buy out your farmer’s market and pumpkin patch. Even my 10 year old nephew thought the live pumpkin pictures were cool, this skull mostly but hey, he's 10. 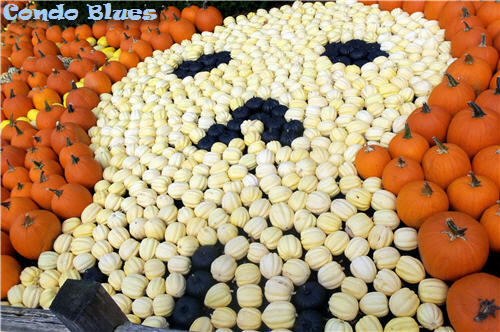 They used small white pumpkins for the skull and pumpkins painted black to make the eyes and mouth. 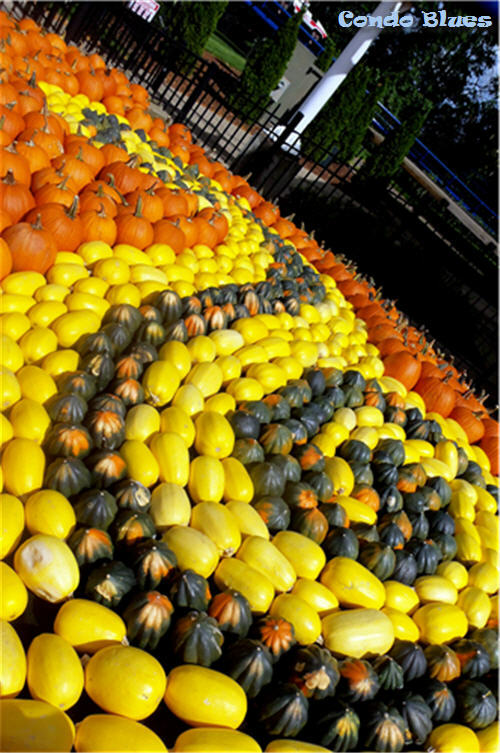 Using real squash and pumpkins as decorative fall mulch? I have a feeling there are going to be some very happy chipmunks and squirrels living on Cedar Point Peninsula this Halloween! The black shape design element in the center is (my best guess) a fountain removed and covered for winter. Tricky! Tricky! 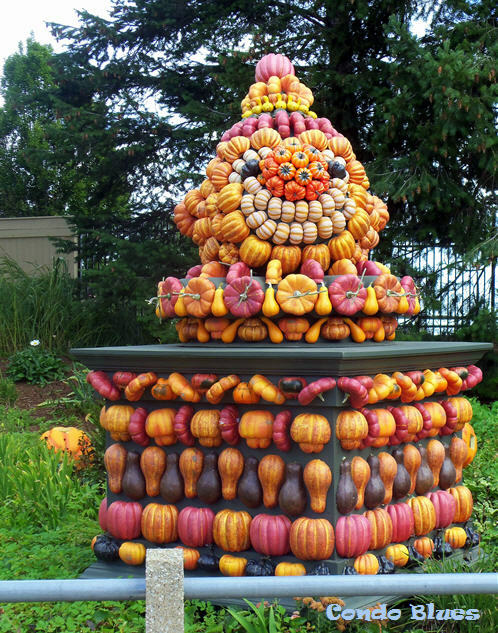 There are pumpkin topiaries too. They look like they were made with plastic squash cut in half and glued onto wood structures. Still fun though. I know, I know eco-friendly friends. 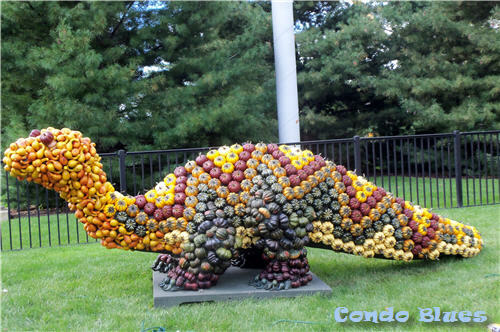 Decorating with plastic fall fruit is not considered green. This one is a balancing act. You get to decide your own personal environmentally friendly decorating adventure. Follow the yellow squash road? 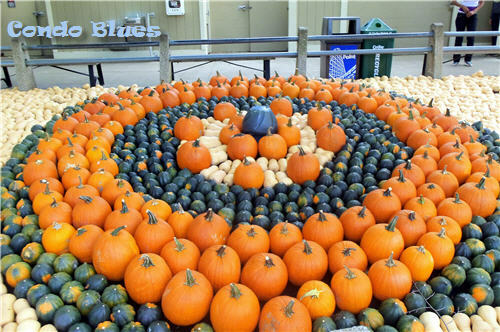 Or you can say it is greener to decorate with real pumpkins and squash because even though they are not reusable, they are made from natural materials. Actually many of the displays I saw used both. 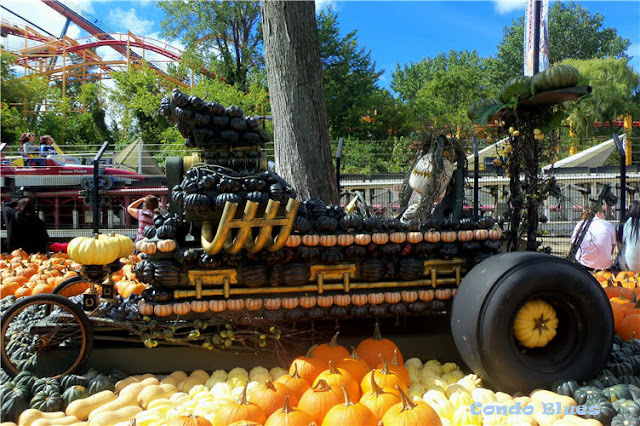 This pumpkin race car features repurposed trophies and wheels ( and probably more), artificial pumpkins, racing on a road of real pumpkin mulch. 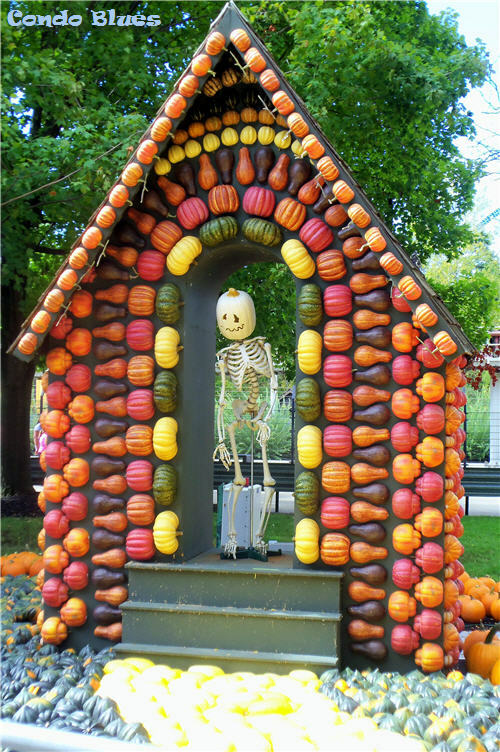 How do you decorate with pumpkins for fall or Halloween? Are you Team Real Pumpkin Décor or Team Fun-ink Décor?